Both were individual TTBC records for Lake Conroe. 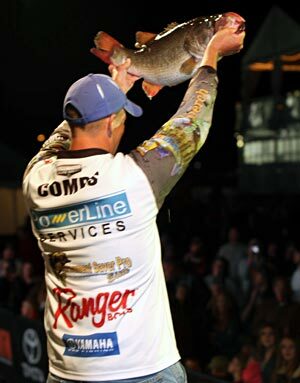 This is the third season for the tournament on Conroe; the first two tournaments were held on Lake Fork as team events. Combs qualified for the TTBC through the Bassmaster Elite Series after a strong rookie season in which he finished among the top 15 in the Toyota Tundra Angler of the Year points race. Toyota Trucks pro Mike Iaconelli of New Jersey was second with 26-12 and Yamaha pro Alton Jones of Texas was third with 24-4. Both said their catches came in a wild flurry of activity that gave them the opportunity to leave their top areas alone and go check other places to fish Saturday and, possibly, Sunday. The TTBC field is comprised of the top 15 points finishers from this season’s Bass Pro Shops PAA Tournament Series, Bassmaster Elite Series and Walmart FLW Tour. Rounding out the field are defending TTBC champion and Nitro pro Brian Snowden of Missouri and four sponsor exemptions. All 50 anglers will return to Lake Conroe Saturday for the second round, leaving Waterpoint Marina at 8 a.m. in two 25-boat flights. The field will be trimmed to the Tundra 10 for Sunday’s final shootout. At stake is more than $400,000 in cash and prizes. Combs competed on the PAA Tournament Series in 2010 and won the tour’s mid-summer tournament on Lake Tawakoni with a record-setting performance, which helped him financially to make the jump to this season’s Elite Series after qualifying through the Bassmaster Central Open circuit. Friday morning, he set the hook on a bass “that really didn’t do anything,” he said, but didn’t give any ground. After about a minute, Combs estimated, she moved out of the brush and he was able to get her safely to the boat. After measuring and weighing her with the Boga Grip scales each TTBC angler uses for the catch-weigh-release format, Combs put her in the livewell. Anglers may bring in one bass larger than 21 inches to weigh for the ATX Wheels Big Bass Award. Combs then continued his milk run on Conroe. Iaconelli prepares for a tournament by going over maps and old notebooks he’s compiled about the fishery, but rarely gets time to pre-practice due to his hectic schedule. He didn’t get to practice on Conroe until Monday morning, the first official day of practice, and quickly began checking key spots. He got clued in on one piece of the puzzle, which led him to try something else and develop two patterns. Friday morning, that work paid off when he caught two keepers on the first two passes in his top area. Then, things ramped up. There are no points on the line in the TTBC, no qualifications for championships or other events. It’s all or nothing for three days and that’s what Iaconelli had in mind. Iaconelli finished second last year and has an itch, as he does in every tournament, to finish holding the trophy. The TTBC’s real-time Fishhound.com leaderboard showed Jones at the top with 24-4 just about immediately Friday morning. Then, nothing for the rest of the day. Jones said he has three or four areas and fished just one of them Friday. He’ll probably hit his best spot Saturday and then move, if necessary. “I didn’t have to touch any of my other areas and just looked around for some new ones,” he said.